Monet's Poblado i Medellin, Colombia : Boka nu! 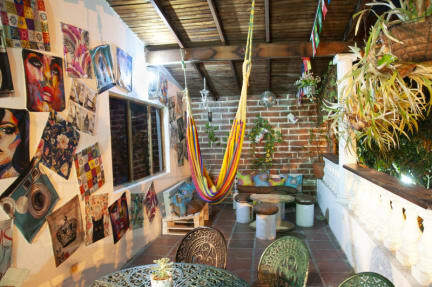 This cozy accommodation with a unique style and design consists of 4 rooms with the option to choose between private or shared, all rooms equipped with fan, bedding and towel. It has a large living room with TV screen. and kitchen for common use. We have 24 hour reception, laundry service, bar open 24 hours, free Wi-Fi, bicycle rental and other delicacies that will delight your palate. We have several types of room, (two private and two shared) two of them with full bathroom and hygiene accessories. Family room with a double bed, a bunk bed and a sofa bed for up to five people, flat screen TV and fan. Private room for two people with shared bathroom and fan. Two mixed rooms with 6 beds each, cell holder and individual lamp for each bed and fan. Check out from 06:00 to 11:59.